This article or section has been flagged for a rewrite. 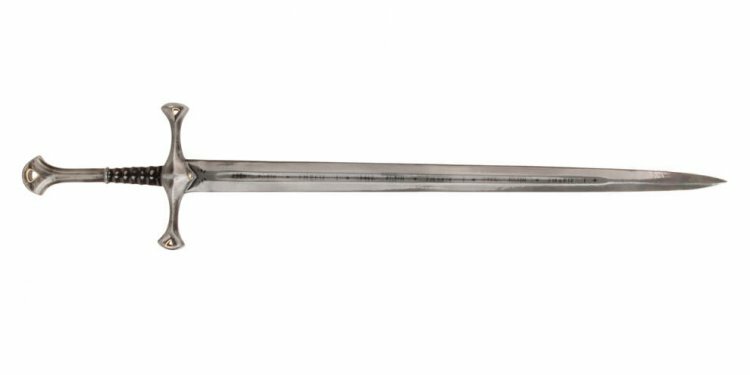 Glamdring (also called Foe-Hammer) was a hand-and-a-half sword, forged for Turgon, the King of Gondolin during the First Age. Glamdring was used in battle only twice in the First Age; Turgon wielded Glamdring in the Nirnaeth Arnoediad, and in the Fall of Gondolin. For over 6, 000 years it went missing, surviving the War of Wrath, until Gandalf (and company) found it (along with and ) in the Troll's cave in and claimed it for himself. He continued to use Glamdring through the events of, and it is now kept safe in the treasure vault at Minas Tirith. It was called Beater by the Orcs along with "Biter" (Orcrist). Glamdring was used by Gandalf to slay the Great Goblin and both Gandalf and Thorin Oakenshield used "Glamdring" and "Orcrist" to slay Goblins in the Goblin's caves. The Rune inscription on Glamdring. Glamdring, along with Orcrist its mate, are described in The Hobbit as having "...beautiful scabbards and jeweled hilts", and Glamdring was referred to by Elrond as "Foe-hammer that the King of Gondolin once wore". In, one of the footnotes to the story "Of Tuor and his Coming to Gondolin" mentions that the sword of Turgon was "...white and gold...in a ruel-bone (ivory) sheath..." While Glamdring is not mentioned by name, it is reasonable to assume that the same sword is described. Glamdring is inscribed with runes in the Elven language. In the movies released by New Line Cinema and directed by Peter Jackson, the runes say "Turgon Aran Gondolin, Tortha gar a matha Glamdring, Vegil Glamdring gud daelo. Dam an Glamhoth." which translates to "Turgon, King of Gondolin, wields, has, and holds the sword Glamdring, Foe of Morgoth's realm, Hammer of the Orcs." This inscription, however, was not mentioned in any of J. R. R. Tolkien's writings. All Tolkien says in is that the names of the swords were given in the runes, but nothing else is clearly stated. The invented inscription for the movie sword, however, does sound plausible, since Elrond was able to identify that the sword belonged to Turgon. One problem, though, is that the inscription is given in Sindarin, but in an essay written late in J. R. R. Tolkien's life, he explicitly states that Turgon had re-established Quenya as the language of his household in Gondolin (see, pg. 348). Curiously, it is mentioned in that Gandalf could not read the runes, but that Elrond could, suggesting they were inscribed not in normal Cirth but in some special mode which Gandalf did not know—or, as is more likely, it was at first an inconsistency on Tolkien's part, keeping in mind that The Hobbit had not originally been intended to be so closely woven into the Silmarillion legends. Although the inscription in the film version is Lord of the Rings-era Sindarin and Cirth, the Elvish languages had certainly changed since Turgon's time, so it may be that since Elrond was a survivor from the First Age, he would have been able to read the inscription, whereas Gandalf, who had lived in Aman until the middle Third Age, was not acquainted with it. This seems highly unlikely though, as Quenya originates as an Elvish language from the Undying lands of Aman and is the mode of speech for the Noldorin exiles in Beleriand; which Gandalf would have known in his life as the Maia Olorin.